When traveling I just love to read news from my favorite social news site reddit.com. A few weeks ago I saw this 'Ask Reddit' post which asked if we could get a reddit version for mobile phones. Well, I thought, it's a cool project and I can do it quickly. While scanning through the comments of 'Ask Reddit' post, I noticed davidlvann's comment where he said that Digg.com already had almost a plain text version of Digg, called DiggRiver.com. to find that the domain RedditRiver.com was not registered! What a great name for a project! I quickly mailed my friend Alexis [kn0thing] Ohanian at Reddit (check his alien blog) to ask a permission to do a Reddit River project. Sure enough, he registered the domain for me and I was free to make it happen! I'll describe how I made the site, and I will release full source code. Update: The project is now live! Update: Full source code is now available! It includes all the scripts mentioned here! My language of choice for this project is Python, the same language reddit.com is written in. This is actually the first real project I am doing in Python (I'm a big Perl fan). I have a good overall understanding of Python but I have never done a project from the ground up! Before doing the project I watched a few Python video lectures and read a bunch of articles to get into a mindset of a Pythonista. The main goal of the project was to create a very lightweight version of reddit, which would monitor for story changes (as they get up/down voted) on several pages across the most popular popular subreddits, and which would find mobile versions of stories posted (what I mean is rewrite URLs, say, a post to The Washington Post gets rewritten to the print version of the same article, or a link to youtube.com gets rewritten to the mobile version of yotube.com -- m.youtube.com, etc.). The project was done in several separate steps. Finally, I created the web.py application to handle requests to RedditRiver.com! This blog and picurls.com run on a dedicated linux server. I use lighttpd web server and PHP programming language for this project. To get RedditRiver running, I had to add Python support to the web server. I decided to run web.py web framework to serve the HTML contents because of its simplicity and because Reddit guys used it themselves after rewriting Reddit from Lisp to Python. Following the install instructions, getting web.py running on the server was as simple as installing the web.py package! It was also just as easy to get lighttpd web server to communicate with web.py and my application. This required flup package to be installed to allow lighttpd to interface with web.py. it found #include's accross multiline text lines just fine, but it did not work with my template files. I tested it like 5 times and just couldn't get it why it was not working. As I said, I am not sure why the original regex did not work in the web.py application, but did work in the interpreter. If anyone knows what happened, I will be glad to hear from you! I wrote several Python modules (which also work as executables) to access information on Reddit - stories across multiple pages of various subreddits (and front page) and user created subreddits. As Reddit still does not provide an API to access the information on their site, I had to extract the relevant information from the HTML content of the pages. print_subreddits_json(), which prints it in JSON format. The output is in utf-8 encoding. description: Yeah reddit, you finally got it. Context appreciated. -oOUTPUT    Output format: paragraph or json. Default: paragraph. -pPAGES     How many pages of subreddits to output. Default: 1. -n          Retrieve new subreddits. Default: nope. This module reused the awesome BeautifulSoup HTML parser module, and simplejson JSON encoding module. The second program I wrote is called 'redditstories.py' which accesses the specified subreddit and gets the latest stories from it. It was written pretty much the same way I did it for redditmedia project in Perl. get_stories(subreddit='front_page', pages=1, new=False), which gets 'pages' pages of stories from subreddit and returns a list of dictionaries of them. If new is True, gets new stories only. print_stories_paragraph(), which prints subreddits information in human readable format. print_stories_json(), which prints it in JSON format. The output is in utf-8 encoding. It can also be used as a Python module or executable. -oOUTPUT     Output format: paragraph or json. Default: paragraph. These two programs just beg to be converted into a single Python module. They have the same logic with just a few changes in the parser. But for the moment I am generally happy, and they serve the job well. They can also be understood individually without having a need to inspect several source files. I think that one of the future posts could be a reddit information accessing library in Python. $ echo "Top five programming stories:" && echo && ./redditstories.py -s programming | grep 'title' | head -5 && echo && echo "Visit http://reddit.com/r/programming to view them!" title: You can pry XP from my cold dead hands! Visit http://reddit.com/r/programming to view them! The database choice for this project is SQLite, as it is fast, light and this project is so simple, that I can't think of any reason to use a more complicated database system. The database has a trivial structure with just two tables 'subreddits' and 'stories'. The 'subreddits' table contains information extracted by 'subreddits.py' module (described earlier). It keeps the information and positions of all the subreddits which appeared on the most popular subreddit page (http://reddit.com/reddits). Reddit lists 'reddit.com' as a separate subreddit on the most popular subreddit page, but it turned out that it was not the same as the front page of reddit! That's why I insert a fake subreddit called 'front_page' in the table right after creating it, to keep track of both 'reddit.com' subreddit and reddit's front page. The information in the table is updated by a new program - update_subreddits.py. The other table, 'stories' contains information extracted by 'redditstories.py' module (also described earlier). The information in this table is updated by another new program - update_stories.py. As it is impossible to keep track of all the scores and comments, and position changes across all the subreddits, the program monitors just a few pages on each of the most popular subreddits. These two programs are run periodically by crontab (task scheduler in unix). The program update_subreddits.py gets run every 30 minutes and update_stories.py every 5 minutes. This is probably the most interesting piece of software that I wrote for this project. The idea is to find versions of a website suitable for viewing on a mobile device. For example, most of the stories on politics subreddit link to the largest online newspapers and news agencies, such as The Washington Post or MSNBC. These websites provide a 'print' version of the page which is ideally suitable for mobile devices. Another example is websites who have designed a real mobile version of their page and let the user agent know about it by placing <link rel="alternate" media="handheld" href="..."> tag in the head section of an html document. I wrote an 'autodiscovery' Python module called 'autodiscover.py'. This module is used by the update_stories.py program described in the previous section. After getting the list of new reddit stories, the update_stories.py tries to autodiscover a mobile version of the story and if it is successful, it places it in 'url_mobile' column of the 'stories' table. PRINT_LINK defines how a print link might look like. For example, it could say 'print this page' or 'print this article'. This directive defines such phrases to look for. IGNORE_URL defines urls to ignore. For example, a link to a flash animation should definitely be ignored, as it does not define a mobile version at all. You can place the .swf extension in this ignore list to avoid it being downloaded by autodiscovery.py. The final part to the project was creating the web.py application. It was pretty straight forward to create it as it only required writing the correct SQL expressions for selecting the right data out of the database. The first version of reddit river implements browsable front stories (RedditRiver and RedditRiverPage classes), browsable subreddit stories (SubRedditRiver and SubRedditRiverPage classes), list of the most popular subreddits (SubReddits class), front page and subreddit statistics (most popular stories and most active users, Stats and SubStats classes) and an about page (AboutRiver class). I have put it online! Click redditriver.com to visit the site. I have also released the source code. Here are all the files mentioned in the article, and a link to the whole website package. All these programs are released under GNU GPL license, so you may derive your own stuff, but do not forget to share your derivative work with everyone. 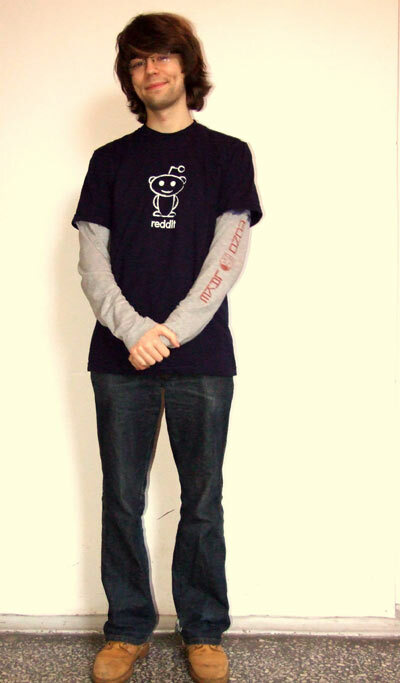 Alexis also recently sent me a reddit t-shirt for doing redditmedia project. Here's a photo of me wearing it. Have fun and I hope you like redditriver!